It is fairly simple to teach your horse to bow; it is similar to the beneficial exercise called carrot stretches. The bow can be free-shaped by first teaching them to lift the near foot, then to drop the head while holding that foot up. Create some kind of target on a stick for the horse to follow. Make sure that he will touch it where ever you put it. Shape them to bring their nose down and under further and further, and then to hold it there. Then start putting the target near the knees and then further and further back. When he is offering to touch the target in the bow position you want, then you can start to fade the target as a cue. 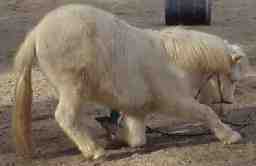 I have taught my horses to do a one knee bow using the following procedure. There are lots of different types of bows. If you don't want your horse to pick up one leg and you just want him to tuck his head and rock back (which is usually called obeisance, circus bow, curtsy bow, or reverance depending upon the head position and how lowered he is, then you just ignore the parts where I talk about how to teach him to tuck his leg. 1. Stand your horse in a quiet location with deep shavings. Ask him to stretch (optional). You should be standing next to his left shoulder. I think it helps if you are facing the horse so he does not think about walking forward. 2. Ask him to pick up his left front leg by tapping on the front of the cannon bone with the whip. 3. Reward him for any lift, working up to when he is comfortable holding his leg up on his own, or allowing you to hold it and move it slightly backwards. You can hold his leg in your hand or sometimes I used a stirrup leather looped around so that if I dropped it, the leg would automatically be released. Know your horse. If your horse seems to become unbalanced, you are safer using at least a short rope (or stirrup leather). Do not get in a position where you could get caught under your horse if he became unbalanced. If you use a rope or stirrup leather, make sure your horse is totally comfortable with this restraint before you proceed. 4. Once you have your horse with his leg up and he is comfortable, start to ask him to rock back. I taught my horses to look for a carrot at their knee. This was where I wanted their head to end up, and it made this movement clearly different from obeisance. Where you choose to put the carrot is up to you, but will affect the final head position. You can use a target stick instead of a carrot if you prefer. This is a good idea if your horse gets snatchy. Remember, they can't see the treat down there. I used a target stick with my filly. You will generally get a better response if you use food directly, especially if you feed multiple treats to get them to hold the position. However, if you use a target stick, your horse will be easier to wean off the idea of bowing without getting the treat in the "down" position. If you use a carrot, make sure it is a long piece so that the horse doesn't nip your fingers. 5. Move towards the horse's back end and gently move their leg back and down. Make sure that the horse is dropping his shoulders down, and not just straightening the elbow joint to allow the leg to move back. I try to keep the leg pretty well folded at this point. It is ok if your horse moves his hind legs back. Some horses do this to give themselves room to drop down. Also make sure that the horse is not just reaching back with his neck and getting his head too far underneath him. Make sure you reward for dropping down, not just reaching back. 6. As the horse drops lower and lower... (this will take many sessions), work up to getting the cannon bone flat on the ground. I often make a pile of shavings under the expected landing spot so that there is even extra padding, and the horse has less distance to drop to the reach the ground. You want the horse to understand that the goal is to have the cannon bone flat on the ground. If you keep the knee angled a little down, then they won't usually try to stand on the bent leg. 7. Your goal is to have the horse with his cannon bone flat on the ground and his nose tucked between his legs, or next to the bent leg. To get the horse to hold the position, you can train him to expect more than one treat and he will stay down to wait for them. You might want to teach your horse to pick up his leg from a tap on the leg before you start the actual bow practice as the padding on his leg might cause him to ignore the tap. Every horse has his own style. Some horses will bow better if you stretch them first. You would do that prior to tapping the leg. 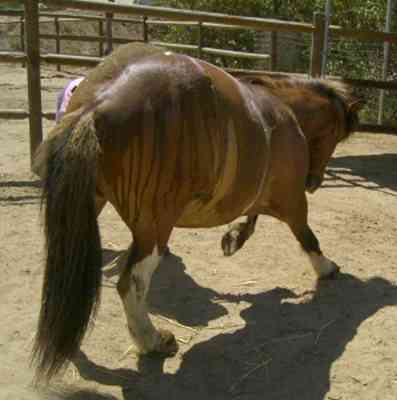 Other horses can learn to move the hind legs back after you pick up the front leg. You can actually ask your horse to back up after you lift the leg. Eventually the horse will learn to do this on his own. The position of the back legs becomes important for how gracefully the horse rises and is able to move off into another movement. 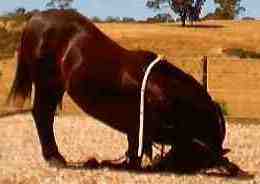 Some horses will kneel when you want them to bow. Some trainers will ignore this and just stand the horse up and ask for the bow again. I say take it! Your horse might be confused for a while as to whether you want a kneel or bow, but once you get the communication straightened out, you will have both. If your horse offers the kneel and you never reinforce it, you might have trouble when you try to get the kneel as preparation for the laydown. Remember to be satisfied with even a little improvement in each session. If the horse goes down too fast and scares or hurts himself, it will take a long time to rebuild his confidence. Remember that bowing is a big stretch for the extended leg. I hope this helps. Some horses catch on quick, others are stiff or nervous and take more time. Your horse will tell you how fast you can go. Once she has a good bow, you can just start rewarding her when she completes the bow instead of while she is down. If you just do a few bows with the treat when she is down,and then a last one where you treat her after she rises, she'll start to get the idea. Remember, you also need some way to tell her how long to stay down. I hold my whip in position until I want the horse to rise. p.s. I originally wrote this for a non-clicker friendly list so I did not push using a target. If your horse targets well, you can skip the step where you feed the food down near the ground. However, some horses will stay down longer if you feed them down there. It depends upon the horse.